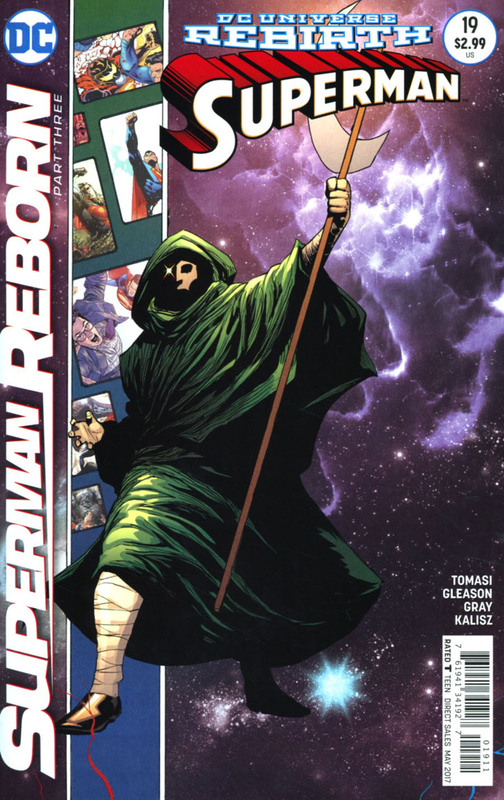 "Superman: Reborn" - Part 2: "Don't Pass Go"
Jon is helplessly floating around in Mxy's strange limbo prison while Superman and Lois confront the imp himself. He makes a comment about how Lois and Clark somehow are always destined to find one another but torments them with clues as to Jon. 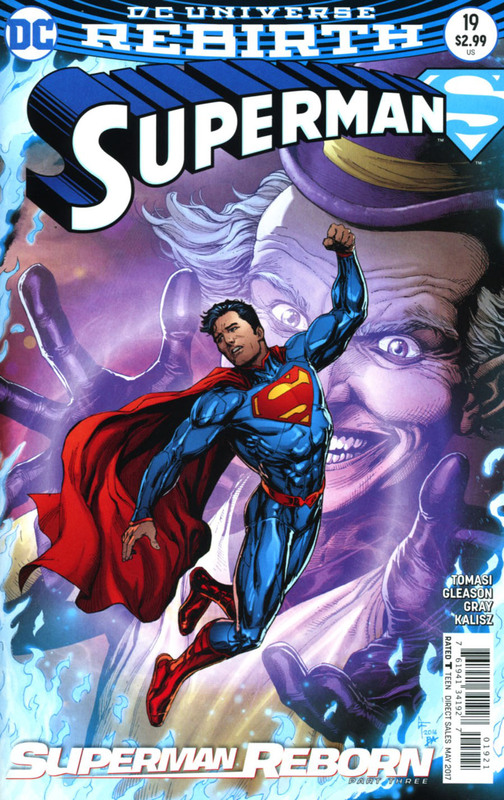 The imp creates a giant tower filled with his signature zany style and tells them that Jon is at the top but to get to him Clark must sign an agreement. The bargain is if Superman can reach Jon Mxy will leave and everything goes back to normal, but if he fails Clark and Lois will be forgotten forever and stay imprisoned in the 5th dimension forever. Jon meanwhile is approached by souls past that have found their way to the 5th dimension, two souls in particular approach him and lead him towards Lois and Clark. A determined Lois and Clark meanwhile are fighting their way up the tower but an angry Mxy realizes he might lose and intervenes and tries to enforce amnesia of Superman. Jon arrives and the two souls take shape exploding with energy until they take shape as two familiar faces and are ready to take Mxy on! Story - 4: This is an amazing time to be a Superman fan, the stories of late have been fantastic. The clues continue to roll in and escalate with every issue but as good as the stories are, and I get this takes place in the 5th dimension, but when did Jon get an energy fist? Still I can ignore all the silliness and overlook that this issue is very thin on plot mainly because of the finale (I won't spoil it). Tomasi and Gleason at least manage to get in as many clues as they possibly can to enhance the madness of Mxyzptlk's games. Is it a clue that Lois and Clark are always destined to find one another? Of course it is and a heavy handed hint at that, but I prefer to look at it with the romantic view that the two are destined to be soul mates no matter the incarnation. I know, and many of you do too by now as the tabloid sites have posted spoilers but let's all sit back and enjoy the ride. Art - 3: Gleason's art is bursting with fun and he obviously enjoys hiding all the easter eggs in plain sight. I am not sure I like the design for Mxy, he is looking more Grinch-like than imp and doesn't really look like his old self. Jon seems to have eyes that are increasing in size as the panels progress, I hope once the whole 5th dimension part of the story is over the art settles down a bit more. Cover Art - 2: Mr Oz looks menacing but this is a pretty weak cover. With such off the wall content inside you would think there was something they could have picked to illustrate instead of something that doesn't happen. Variant Cover Art - 5: With Mxy revealed the cover suddenly takes on a new sinister turn and as he has returned with revenge in mind Gark Frank draws a mean Mxy! Clark is about to lose it all but wait that isn't Clark... It's New 52 Clark! With the art fully realised the cover takes on brand new meaning and comparing it to the main cover it's definitely the more eye-catching of the two. Definitely one of Gary Frank's best of the recent variant covers!